In this wide-ranging interview between two mothers who have experienced the grief of the deaths of their children, Nancy Guthrie transparently answers questions asked by host Sharon Betters. Through how to answer the question “why” through the grid of God’s love and sovereignty, to practical counsel for protecting marriages assaulted by grief, Nancy doesn’t flinch. Nancy’s loss of two children uniquely qualifies her to offer help and hope in sorrow’s darkest night. No matter how shattered the heart, there is hope in the midst of grief. Nancy (left) and Sharon (right) sharing their grief and recording this interview. Nancy and her husband, David, have a twenty-something son, Matt, and have had two children, a daughter, Hope, and a son, Gabriel, who were born with a rare genetic disorder called Zellweger Syndrome and each lived six months. 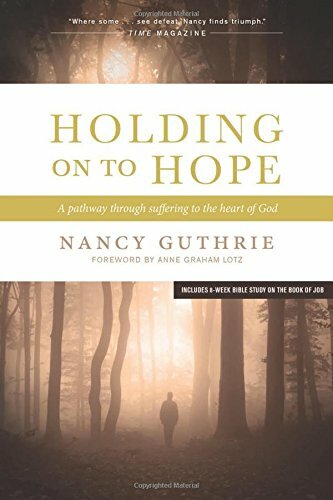 Nancy offered many of the lessons she learned from this sorrowful experience in her 2002 book, Holding On to Hope: A Pathway of Suffering to the Heart of God. She regularly hears from readers who have been touched by the book from all around the world as the book has been translated into German, Danish, Norwegian, Korean, Chinese, Spanish and Portuguese. Since then, Nancy has continued to write books that reflect her compassion for hurting people and her passion for applying God's Word to real life. Her desire to grow in her understanding of God's Word has prompted her to pursue graduate work in theological studies. She and her husband, David, host weekend Respite Retreats for couples who have faced the death of a child. She speaks regularly at conferences nationally and internationally, and is a regular contributor to The Gospel Coalition including hosting the Help Me Teach the Bible podcast. Nancy and her husband make their home in Nashville, Tennessee where, according to Nancy, life is less about professional pursuits than about the ordinary aspects of being a wife, mother, friend, and follower of Jesus, with clothes to wash, e-mails to answer, and a friend to listen to. For more about Nancy, visit her website!